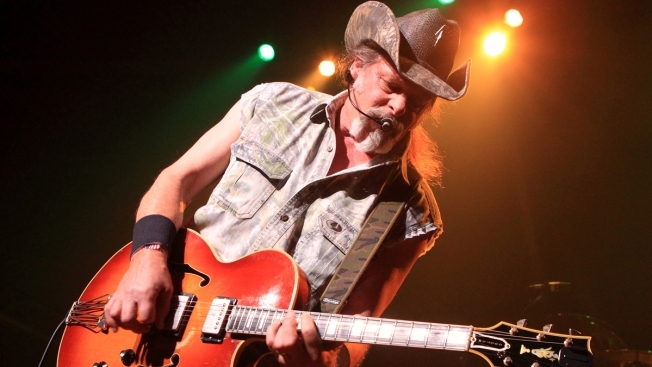 This Aug. 16, 2013 file photo shows Ted Nugent performing at Rams Head Live in Baltimore. Rocker Ted Nugent says the Florida students calling for gun control have "no soul" and are "mushy brained children." The 69-year-old made the comments Friday while defending the National Rifle Association as a guest on the Joe Pags show, a nationally syndicated conservative radio program. Nugent, a longtime member of the NRA's board of directors, said survivors of the Feb. 14 shooting at Marjory Stoneman Douglas High School are wrong to blame the NRA and its members for mass shootings. "These poor children, I'm afraid to say, it hurts me to say, but the evidence is irrefutable: They have no soul," Nugent said. He added that the gun control measures the students support amount to "spiritual suicide" and "will cause more death and mayhem." A representative for Nugent did not respond to a request for comment on Saturday. Some Parkland students responded on social media and demanded an apology. "If only he saw all the tears. If only he had to look into the eyes I've looked into. If only he saw what this did to all of us," junior Cameron Kasky said on Twitter. "And here the NRA is, receiving more fear-based donations than ever. Talk about 'no soul.' This guy better apologize. Seriously." Senior Kyra Parrow said it's funny that the NRA rails against bullying while Nugent was "being a 5 year old acting like a bully" to her and her classmates. Nugent made the comments the same day several advertisers dropped Fox News personality Laura Ingraham after she mocked a survivor of the Parkland shooting online. Ingraham said Friday she will take a weeklong "Easter break" with her children while guest hosts fill in on her show, "The Ingraham Angle." She drew backlash Wednesday when she shared an article on Twitter saying student David Hogg had been rejected by four colleges and was whining about it. She later apologized and said Hogg should be proud of his grades.